To mark the seventieth anniversary of the declaration of the republic and Ireland’s departure from the Commonwealth on 18 April 1949, we are publishing a number of our entries of figures involved in Irish foreign policy in the decades leading up to it, all of whom feature in the forthcoming online exhibition Republic to Republic: Ireland’s international sovereignty, 1919-49, curated by our colleagues in DIFP and UCD Archives. The RIA will also be hosting a panel discussion to mark the occasion on Thursday 18 April. John J. Hearne, as one of the main architects of the 1937 constitution, played a key role in the drafting of the Executive Authority (External Relations) Act, 1936. 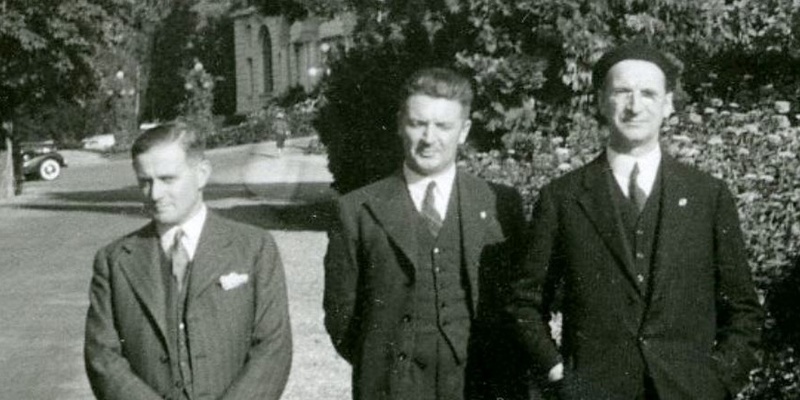 He is pictured above, on the far left, while attending a meeting of the League of Nations in 1938 (Image courtesy of UCD Archives). Read his DIB entry by Marcus Bourke and Michael Kennedy below. John Joseph Hearne (1893–1969), diplomat and lawyer, was born 4 December 1893 at 8 William Street, Waterford, fourth son and sixth among seven children of Alderman Richard Hearne, mayor of Waterford and leather merchant, and Alice Mary Hearne (née Power). He was educated at Waterpark College, Waterford, and UCD, graduating with BA and LLB degrees. As an undergraduate Hearne campaigned for the Irish parliamentary party in the 1918 general election. Called to the Irish bar in 1919, he was a member of the Leinster circuit (1919–23) (which included Waterford). In 1922, on the formation of the National Army, he became a legal officer in the Athlone command with the rank of commandant. In 1923 he joined the attorney general's office as assistant parliamentary draftsman, a post he held until 1929, when he became legal adviser to the Department of External Affairs, a post he held until 1939. With his legal background and qualifications he was a valuable asset to both the Cosgrave and de Valera governments, assisting with commonwealth and League of Nations matters. In 1926 he attended the imperial conference in London as an advisor to the Irish delegation headed by W. T. Cosgrave and later led by the minister for justice, Kevin O'Higgins. He also attended the conference on dominion legislation in 1929, as well as several assemblies of the League of Nations, sessions of the International Labour Organisation, and other international conferences on international law. In the spring of 1935 Éamon de Valera, the president of the executive council, set up a committee of three senior civil servants to commence work on the preparation of a new constitution to replace the 1922 constitution – Philip O'Donoghue, senior legal adviser to the attorney-general; Stephen Roche, secretary of the Department of Justice; and Hearne. They were later joined by Maurice Moynihan and Michael McDunphy, secretary and assistant secretary to the executive council. As the drafting of the new constitution continued over the next eighteen months, most of the work devolved on Hearne. In the previous few years, through his involvement in some of the legal measures implementing de Valera's policy of dismantling the Anglo–Irish treaty of 1922 and the Free State constitution, Hearne won de Valera's respect, so that by the time the final draft of what became the 1937 constitution was published, Hearne became recognised as the main architect of the document. Indeed, some of the principal articles on such topics as fundamental rights and principles of social policy reveal unmistakable signs of Hearne's florid style – understandably so, since he was the only member of de Valera's team with previous experience of legislative drafting. In recognition of the work of Hearne and O'Donoghue on the new constitution, which was approved by referendum on 1 July 1937 and came into operation on 29 December 1937, both men were made senior counsel in the autumn of that year. In 1939 Hearne became Ireland's first high commissioner to Canada, serving in Ottawa until 1949. In 1950 he became Irish ambassador to the USA, serving in Washington until his retirement from the diplomatic service in 1960. He then returned to his first public post in the parliamentary draftsman's office, where he served from November 1960 to November 1961, before moving to Lagos in 1962 as a legislative consultant to the government of Nigeria, retiring after a couple of years. Hearne died 29 March 1969 aged 75. He married (June 1930) Monica Mary Martin; they had two sons and a daughter. The Dictionary now comprises 10,500 lives. Follow the DIB on Twitter @DIB_RIA – where we post topical biographies.